Fighting is problem solving at high speed. You’re presented a problem, and normally have a very short span of time to come up with a solution and then apply those actions. In order to develop the right answers you have to ask the proper questions. As you go through your daily activities you’re constantly asking yourself questions, assessing the environment and making choices. Most of the time you’re not even aware of it because a majority of your actions are based on decisions made at a subconscious level. Is it safe to cross the street? Without consciously thinking about it you look both ways to verify it’s clear before stepping off the curb. So you’re constantly making decisions, but are you asking the right questions? Specifically what are the people around you doing? Maintaining awareness of your environment is and always will be critical to survival. In the old days if you didn’t keep keen a black “painter” – that’s southern for panther – or “bare” – bear – dragged you off for lunch. Now days most our trouble comes from two legged beasts. Spotting potential problems allows you to develop and initiate your response sooner. This means you have more options. Why did that guy in the parking lot start looking at you when you got out of the truck? Is he a threat? Is anyone else out there working with him, coming from another direction? He’s walking towards you, at the same time scanning his environment. You change directions and he stays on his original track. No trouble, but if it had been it’s a lot better to know about it sooner than later. It’s dark. You’re walking through a parking lot. You sense a change in the atmosphere; your subconscious has picked something up that’s not quite right. Suddenly, from around a corner guy with knife moving towards you fast. Not doubt about his intent. Can you create distance? Is there time to get your pistol before he’s on you? You move left and rearward, forcing him to change directions. The pistol is in your hands, and without even being aware you’ve been telling him to stop. The big question now that you have to ask is, “Do I need to shoot?” The answer should be pretty cut and dried. If it’s not absolutely, “Yes if I don’t shoot now I will suffer serious harm,” you better be thinking about another option. You have to shoot to stop the threat. After every shot you’re asking, “Do I need to shoot again?” This is why you practice following through after every shot, recovering from the recoil, reacquiring another sight picture and resetting the trigger. In a confrontation, there ain’t no time to shoot, look at the target, then decide you have to shoot again. The threat is down. Now there are a lot more questions. Are there any more threats? Where is cover? The guy on the ground may get back up, are you ready? Is it safe here to call 911 or do you need to get somewhere more secure? What are you going to do when the police arrive? Fighting is problem solving at high speed. Success depends on having as many answers as possible in advance. For example should I have to shoot to stop a threat, I’ve already made the decision to hit ’em in the chest several times and immediately follow up by hammering ’em in the pelvis. I may not have to fire that many rounds; it will be dictated by the threat’s reaction. But, in that case I’m making a decision to stop doing something, which is a lot easier than trying to remember to do it. Shootrite founder and director Tiger McKee is a lifelong student of personal combat, and is one of the nation’s top firearms instructors for armed citizens, law enforcement, military and security personnel. 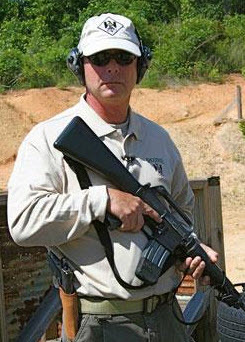 McKee was awarded an expert rating with handgun and rifle by Colonel Jeff Cooper of Gunsite, and has been an adjunct instructor at Thunder Ranch since 1995. He has assisted various agencies in designing their own customized training programs, and as an adjunct instructor for the Federal Bureau of Investigation he currently enjoys teaching some of the world’s most elite law enforcement agents. Tiger’s extensive experience has given him a prominent position and voice in the world of modern tactical training. He is a regular guest on Personal Defense TV, a staff writer for SWAT magazine, Tactical Gear magazine, and a columnist for the Tactical Wire, an internet publication. In 2005 he published “The Book of Two Guns,” a unique chronicle of ten years of training in the tactical use of the 1911 pistol and the AR-15.